In this workshop you’ll go on sonic adventures exploring a tool that’s basically a tiny keyboard – the makey makey. Alligator clips help you turn anything conductive into a controller. 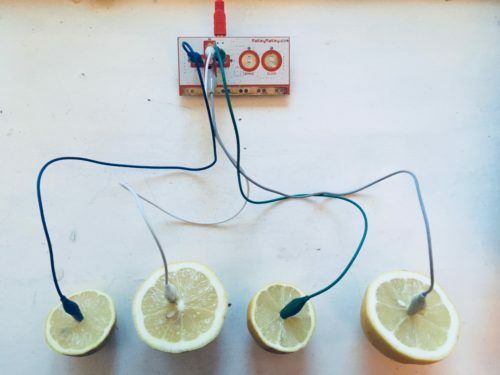 DIY your own lemon xylophone or invent a brand new soundtoy. We will build all kinds of gizmos together. You’ll also learn how to trigger sounds using a block based programming language called Scratch. No problem if you’ve never coded before, it’s like playing lego. You can buy a makey makey for a reduced price at Common Ground. We’ll also have some available to use in case you just want to jam. Note: Please let us know if you can’t make it max. 24 hours before the workshop, otherwise, we can’t reimburse you.